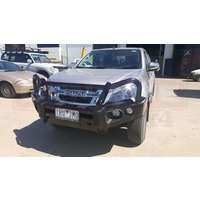 THIS LISTING IS FOR A FITTED BULLBAR. Please contact us before purchasing to check if we have in our warehouse or it is in another warehouse. Once you have purchased the item give us a call on 0383906065 to book in the fitting. We are located at Unit 1/17 Westwood drive Ravenhall 3023 Victoria. This fitting involves the foglights and indicators wired up, winch bracket and bullbar mounted (drive in drive out) complete. 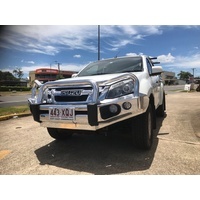 If you wanted a winch fitted at the same time it's an extra $100 (you supply the winch) or we can supply one and prices vary depending on the winch needed. If anything else needs to be fitted at the same time just let us know. We pride ourselves on our work, if you require more photos please let us know. 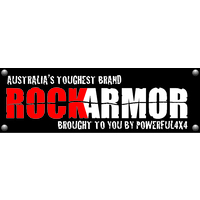 Rockarmor Elite bullbars are a facelift of the premium bulbar range. Rockarmor Elite bullbars are a good looking bar that is very strong with 63mm cross tubing that offers great protection with great angles of approach. Rockarmor elite bullbars are winch compatible, ADR approved and airbag compatible. Rockarmor elite bullbars are powdercoated in a durable black and have underbody skid plate protection, also standard is the foglights and LED blinkers. Rockarmor elite bullbars have twin aerial brackets, twin high lift jacking points and driving light mounting points, which really makes this bullbar the complete package.